Next, I identified the top 10 that jumped out at me and wrote my insights on how you can have them (if you don’t already). These 10 things are what move the needle in your life, personally and professionally. 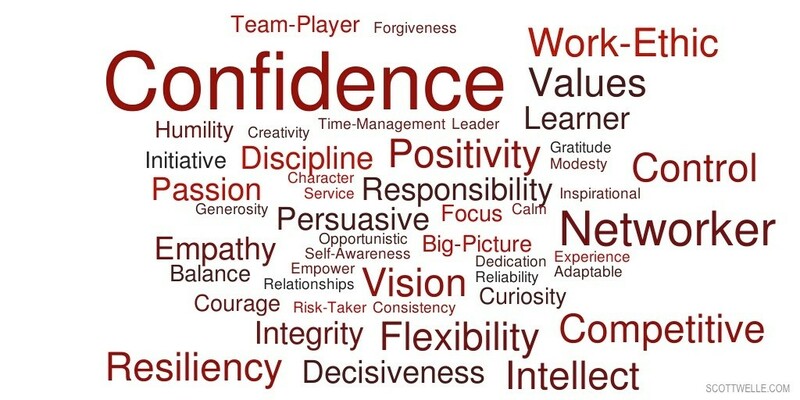 Like any of these things, no one is born with confidence. It is something you create. Something you choose. Preparation is a great way to build confidence but it mostly starts with knowing that you need no good reason to be confident. Just choose to be that way, from the moment you wake up! Why would you choose the alternative? Think about the things you TRULY value in your life (relationships, awards, achievements) - were these things easy or did they require work? Here’s the problem - we only see the AFTER. We never see the BEFORE. Behind every Outperformer is someone who has failed, failed, failed, failed, and failed again, but they keep at it, and THAT is why they’ve ultimately succeeded. I’m a believer that competition (if done correctly) makes everyone better. I think removing competition gives people a false sense of security and that’s just not how the real world works. Here’s the difference - Outperformers are competitive with THEMSELVES. They don’t wait around for managers to set their quotas and give them benchmarks. They set their own high standards and competitively strive to reach them. Goals are easy and safe to talk about but they don’t inspire people. Having a crystal clear VISION for what you want your life to look like and making the conscious decisions to bring this to fruition, does. Vision is also what inspires people to follow you. Confession - as I’m writing this, I’ve got the TV show Shark Tank on in the background (I’m a fan). Every now and then an entrepreneur will come into the tank and, even though their business keeps losing money, they’re too stubborn to change their thinking and try something different. Be who you are. Outperformers know who they are with someone is who they are with everyone. Who they are in anything is who they are in everything. Remaining positive and upbeat, regardless of circumstances, allows Outperformers to take calculated risks, effectively respond to adversity and rally other like-minded people around them. You can still move forward with a couple of broken spokes, but not at nearly the velocity you could if everything was solid and working in harmony. Self-Awareness means harnessing your strengths but also recognizing what's necessary to improve your weaknesses. Want To Perform At The Highest Level in 2015?